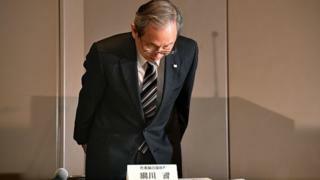 Image caption Toshiba president Satoshi Tsunakawa apologises for "causing concern"
Toshiba shares fell 20% on Wednesday after the firm warned that its US nuclear business may be worth less than previously thought. The slump was large enough for trading in stocks of the Japanese industrial giant to be automatically halted. Shares had already fallen 12% on Tuesday after reports of the likely write-down began circulating. Toshiba said the possible heavy one-off loss was linked to a deal done by a US subsidiary, Westinghouse Electric. Westinghouse bought the nuclear construction and services business from Chicago Bridge & Iron in 2015. There is now a dispute over the costs of the deal and the value of the assets it took on. Toshiba president Satoshi Tsunakawa apologised for "causing concern". Rating agencies Moody's and R&I both downgraded Toshiba's credit rating, which will make it more expensive for the company to borrow. R&I warned that it could issue further downgrades, while Moody's cautioned that further impairments could lead to Toshiba breaching agreements with its banks. The warning was a blow for the firm's corporate reputation, which is still struggling to recover after it emerged in 2015 that profits had been overstated for years, prompting the chief executive to resign. Since then, Toshiba has been trying to slim down the business, including selling its medical devices operations to Canon. While the share price slump is a blow for investors, 2016 had still been a pretty good year given that the stock had risen more than 77% before this week's falls.